What do you love about Canada? There is so much to choose from! The friendly people, the beautiful National Parks, all of the opportunities – there really is so much to love about Canada! With Canada Day quickly approaching, I’ve created a free Canada Day Word Search for all of you! It’s a great game for the kids to play while waiting for the Canada Day festivities to start. 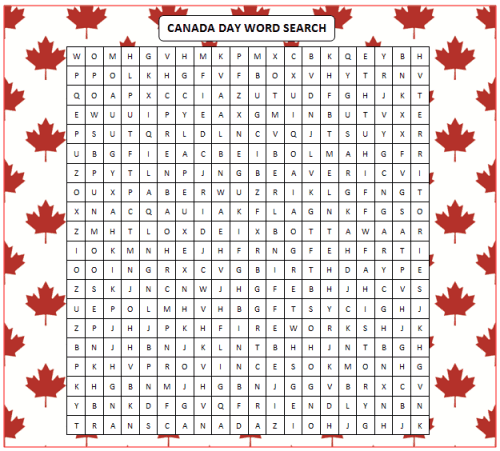 You could even print this free Canada Day word search and laminate them to use as placemats at a BBQ party. Provide some red washable markers and let the kids see how many words they can find while they are enjoying their Canada Day meal. You could even print some and add them to a Canada Day hostess gift basket. What other words would you use to describe Canada? Looking for more fun Canada Day ideas? Check out this free Canada Day trivia game! You can play this with your friends and family to learn a little more about Canada and test your knowledge about this great country. Here is a link to some more Canada Day facts that you could turn into a fun trivia game. For more fun ideas for the holidays including party ideas, free printable games, activity ideas and more – visit our special Holiday Fun page. Scroll down to July for our Canada Day ideas including free printable party supplies! We also have loads of free printable games on our Free Printables Games page like word searches, scavenger hunts, charades and more! We’re always adding new & fun ideas to enjoy with your family. Stay updated on the latest ideas by following us on Facebook, Twitter, Pinterest and Bloglovin’.